When most people dream about their wedding décor, they're envisioning never-ending cascades of florals and romantic lighting displays. But something as simple as a piece of paper used in a unique way can transform your wedding décor from ordinary to extraordinary. Here, get inspired by 50 of our favorite ideas. Oversized paper flowers attached to a simple sheet creates a romantic ceremony backdrop. Take the idea of a floral backdrop to the next level with an ombré wall of paper blooms. Want something a little more subtle? 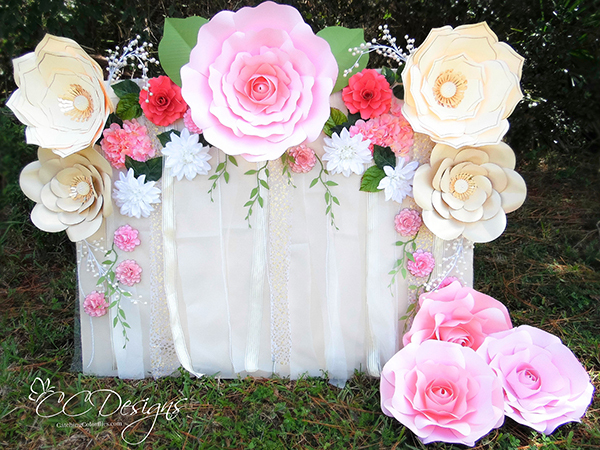 A simple cascade of paper flowers is all you need. A chalkboard backdrop, gold lettering, and corner of flowers creates a lovely backdrop for your DIY photo booth. Say it loud and clear at your ceremony with oversized signs. Tissue paper flowers create a charming vintage-inspired backdrop, perfect for a dessert display. Monochromatic pinwheels add a bit of whimsy to a classic dessert display. Punch up your display with jewel-toned fans, honeycomb balls, and paper leaves. Make a bold impact with a paper flower ceremony arch. For a simple DIY, cut out paper hearts from scrapbook paper, glue them to skewers, and line the aisle with dozens of hearts. Transform a minimalist ceremony structure with origami flowers and paper kites. Write your vows on a scroll for a memorable ceremony backdrop. Create an ethereal vibe with paper cranes strung overhead at your outdoor wedding ceremony. Strands of paper cranes create a wonderful ceremony backdrop. Add some fun to an elegant reception with paper cranes overhead. Carry oversized paper flowers down the aisle. Give your flower girls sweet paper parasols for fun photo props. Hang a heart-shaped wreath made from the pages of your favorite book. An origami tree is a unique touch for your table décor, especially for a holiday wedding. Pin metallic floral cutouts into a Styrofoam ball for an easy and glam pomander. Create a table runner out of paper doilies for a vintage-inspired vibe. Spell out your new monogram with paper flowers. Get in on the greenery trend with a sweet paper version. Quick, easy, and fun — a polaroid-inspired setup for your photo booth. Not a big fan of cake? Use a little papier-mâché for a cake piñata instead. Colorful streamers create a bold and beautiful ceremony backdrop. For a visually-appealing backdrop, try twisted streamers in varying widths and colors. Boldly interwoven streamers are a wonderful juxtaposition against the classic wedding décor beneath. Streamers entwined with twinkling lights creates magical overhead décor. A heart garland is even more sweet when made from pages of romantic novels. Vintage-inspired paper coasters strung up as a garland give off a sweet vintage vibe. Butterfly cutouts add a whimsical touch. A lovely lyrical garland made from sheet music is a sweet touch for any wedding. A collection of laser-cut heart garlands comes together beautifully as a paper chandelier. A paper garland makes a sweet backdrop behind your sweetheart table. For a charming centerpiece, arrange spiral paper flowers in painted mason jars. Perfect for a literary wedding, these paper flower centerpieces are upcycled from book pages. Pearl pins and and a chrome vase make this floral pomander centerpiece look perfectly elegant. For a beautiful rustic centerpiece, encircle a tree branch candle holder with crepe paper flowers. Take your ceremony décor to the next level with paper flowers on the ceiling. Who knew paper cones could make such gorgeous décor? Mexican wedding banners in classic white beautifully accentuate this barn wedding. Simple sheets of paper come together to create a modern overhead display. Gold-painted leaf cutouts suspended from the ceiling is perfect for a fall wedding. There are few things more romantic than dining under the stars. A paper lantern chandelier works in any setting, from a barn to a ballroom. Colorful pendant banners add a whimsical touch to this tented wedding. Mix-and-match paper lanterns really pop against a black and white striped tent ceiling. Tissue pom poms give this ballroom wedding a homespun touch. Put the focus on your dance floor with an incredible paper installation overhead.